In our continued quest to get more evaluations from the cardiac room, Weingart has created an online form at http://eval.ehced.org. It is basically identical to the new innovations eval (and the paper forms in the cardiac room). Attendings: sometime during your cardiac shift, please go to http://eval.ehced.org and complete an eval of the resident you’re working with. No username/password required. Should be super fast. Your input is invaluable and the residents deserve it. Alternatively, you can log on to New Innov or complete a paper form. Residents: sometime during your cardiac shift (don’t wait until the attending is wrapping up to go home), pull up the evaluation on http://eval.ehced.org, complete the general info (your name, attending name and date) and then ask the attending to complete the evaluation. This is probably the best way to ensure you get an evaluation and feedback. The web address is also posted on the wall next to the attending computer in the Elmhurst cardiac room. The attempt to improve pt flow taught us many lessons, but for now leadership has decided to return to pt distribution the “old way”: esi 2’s and 3’s will be distributed in rotation to all 6 primary rn’s evenly. We will no longer be “cohorting” admitted pts. Pts coming out of the resus room will be distributed to the appropriate zone. When a resus resident is working: all resus pts will go to the resus resident. pts coming from the resus room, will be evenly distributed to the north and south zone geography and rn staff. 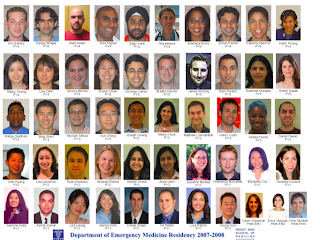 If staffing permits, an EM resident will be assigned primarily to care for pts in the resus room. Post stabilization resus pts will be distributed to both the north and south zone– they will continue to be monitored by the resus resident and resus attending. It is possible that the south zone may be staffed by 2 interns and an attending. This staffing poses risk, especially if esi2 pts are assigned to the south zone. Attending physicians are encouraged to adjust staffing in the ED on a shift by shift basis, and they are encouraged to discuss staffing with the charge nurse to ensure the safety of our pts at all times.